The Wedell Cellars dream began in the late 1970's when Maurice Wedell began working with a well known French Restauranteur in Los Angeles. During the next ten years with the restauranteur’s guidance, Maurice developed a passion for wine. This passion led Maurice in 1988 to move along with his wife Susan, and their newborn son Justin, to the Central Coast of California, an area that had at that time already become known for producing highly acclaimed Chardonnay and Pinot Noir. Immediately, the Wedell’s planted a small experimental vineyard of Chardonnay in what became their first step in realizing their dream of creating wines styled after the great Burgundies of France. Knowing that they would need expert guidance in their quest to create such a wine they sought out a local grape grower to assist in the management of the vineyard and to make their wine. The first vintage in 1994 consisted of one barrel of wine, twenty-eight cases of Chardonnay were produced from their own grapes and from purchased grapes. Encouraged by the results in 1994, Maurice and Susan decided to expand production gradually over the next few years by purchasing grapes from selected vineyards in Edna Valley. In early 1996 four acres of Chardonnay and one+ acre of Pinot Noir were planted on a steep north facing hillside in the southern end of Edna Valley. After much careful study and analysis, the realization was made that to truly create the best Pinot Noir, Southern San Luis Obispo County was not the most perfect place to grow Pinot Noir and Chardonnay. 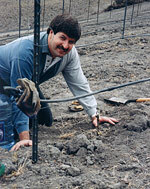 Thus, beginning with the 2004 vintage Wedell Cellars began sourcing Pinot Noir in the now famous Santa Rita Hills AVA, What began as sourcing from a single vineyard has expanded to sourcing both Pinot Noir and Chardonnay from some of the most well know and highly respected vineyards in the appellation. Wedell Cellars has always believed that “less is more” and when that philosophy is applied to Pinot Noir it is our belief that we cannot make massive quantities of great Pinot Noir, to achieve truly remarkable Pinot Noir the volume will never be large. To that end, Wedell in 2009 created a companion label “Wavertree” where we could use some of the lesser barrels from our Wedell Cellars Pinot Noir blocks to create a value priced Pinot Noir of exceptional quality whilst increasing the intensity of the Wedell Cellars Pinot Noirs. There are two “Wavertree” Pinot Noirs, one from Santa Rita Hills and the other from Santa Barbara County, both have been recognized by wine writers for the excellence and value. Other wines in the “Wavertree” portfolio include a couple of white wines, a Sauvignon Blanc and Viognier, both sourced from the Santa Ynez Valley of Northern Santa Barbara County. 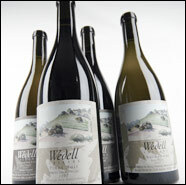 Wedell Cellars wines have been recognized by various wine writers for their excellence. Our wines have consistently scored 90 points and above when reviewed by wine critics. One well known wine publication, Decanter Magazine, stated in an article that one of our Wedell Cellars Pinot Noir's could easily be mistaken for Domaine de la Romanee Conti, the finest French Pinot Noir made .